Acinetobacter baumannii BL88, an environmental isolate, was resistant to 13 metals and 10 antibiotics. Plumbagin cured resistance to silver, cadmium, antimony, streptomycin and ampicillin at varying frequencies. However, only silver resistance transferred (1 × 10−6 recepient−1) to Escherichia coli K12 during conjugation. Correspondingly there was transfer of a 54 kb plasmid (pUPI199) from A. baumannii BL88. The plasmid transformed E. coli DH5α cells at a frequency of 1 × 10−8 recepient−1. The growth rate of E. coli DH5; (pUPI199) was slower as compared with E. coli DH5α. Plasmid pUPI199 was 76 and 9.6% stable in the host A. baumannii BL88 in the presence and absence of selection pressure, respectively. 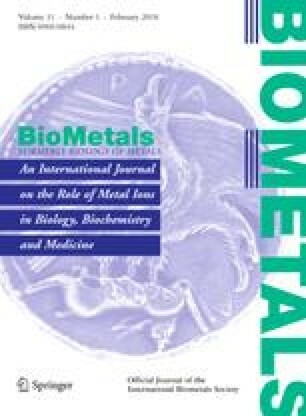 A. baumannii BL88 was found to accumulate and retain silver whereas E. coli DH5α (pUPI199) effluxed 63% of the accumulated silver ions.